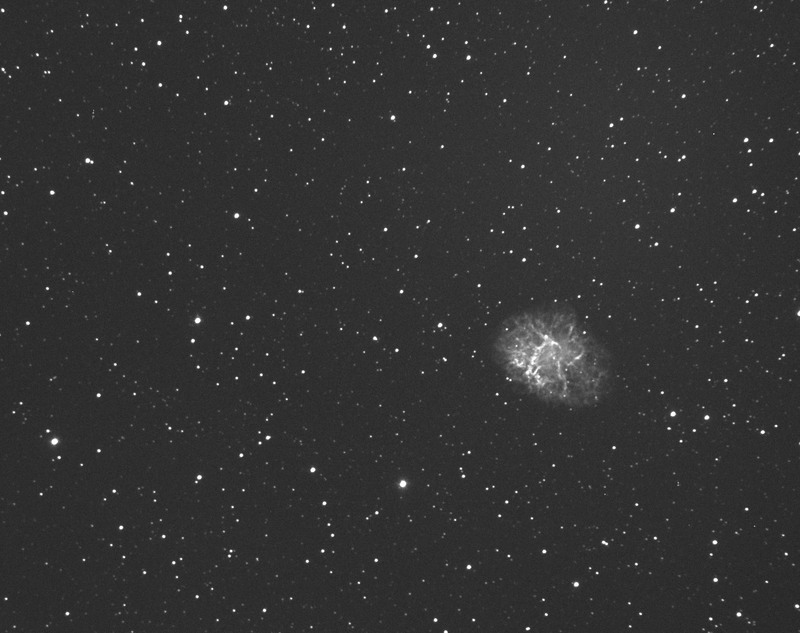 The first of the Messier objects. This emission nebula was created in 1054 when a star exploded. This supernova was observed by Chinese astronomers and was recorded to have been visible to the naked eye during the day for 23 days and in the nighttime sky for two years. The surviving star is a neutron star or a pulsar , and is spinning round at 30 revolutions per sec. Post-processing AA7, Dark framed,DDP, sharpening. First use of my new Ha filter. First trial guided images on new mount and new camera. Perfect guiding, cropped to remove bad vignetting around the edges caused by cheap focal reducer; awaiting arrival of CCD47 FR.